Opposition leader Yitzhak Herzog continues to express confidence that the “Zionist Camp” will head the next coalition. Yitzhak Herzog has a gay problem? 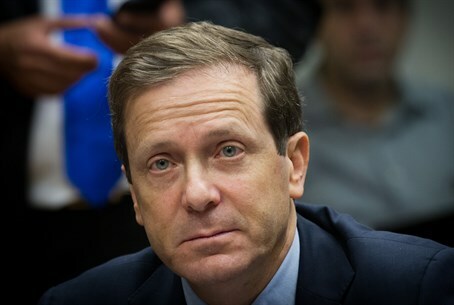 Opposition leader Yitzhak Herzog said on Saturday night that if the “Zionist Camp”, the joint Labor-Hatnua list which heads, wins just one more seat than the Likud, he will head the next government. Herzog's comments in an interview on Channel 2 News come several days after Prime Minister Binyamin Netanyahu cited "authoritative sources" as saying that President Reuven Rivlin will ask the leader of the largest party in the Knesset to head the next government, regardless of whether he has enough support from other parties to form a coalition. Rivlin has denied the claims. "If the Zionist Camp will have just one seat more than Netanyahu, I'll head the government," said Herzog, adding, “Netanyahu has no set coalition. I will be the next Prime Minister. I believe in it and I have proven that I can connect between different political sides." Herzog also said that the agreement between Iran and the six powers is “problematic” and “has serious issues”, but also argued that Netanyahu’s upcoming speech before Congress is not the solution. “The problem is that what Netanyahu is doing is not helping. [The speech] is a mistake. He should have built trust with the American president. American Jewish leaders are disgusted by this move. Netanyahu is prepared, for the sake of his own advancement, to harm the interests of the State of Israel,” he claimed. "Netanyahu failed in security and failed with Hamas," continued Herzog who, when asked about his partner, Tzipi Livni, who was part of Netanyahu’s coalition, replied, “Livni made an effort to achieve peace. She is my partner and has an international status." Indeed, recent polls have shown that Likud is edging out the Zionist Camp for the largest party, but only by one seat. Previous polls had the Zionist Camp as the largest list. Nevertheless, most polls have shown that even if Herzog heads the largest party after the elections, he will have troubles forming a coalition. Numerous polls over the past several weeks show a right-wing government with 42 seats, whereas the left does not have enough for a majority.